TWO Cuestars Gold Tour players have won promotion to a national snooker circuit for the country’s best 32 amateur players aged under 21. And two more have qualified for the play-offs. Bradley Cowdroy and Oliver Sykes finished second and third respectively on the EASB Regional Junior Tour South. The announcement that a third spot was available for the southern region came on Cowdroy’s 16th birthday. It meant he was guaranteed promotion regardless of how he got on in the sixth and final leg at the South West Snooker Academy, Gloucester. Cowdroy, who is based at Greenbaize Snooker Club, Bournemouth, said: “I was gutted to throw away promotion last season but that just made me even more determined to go one better this year. 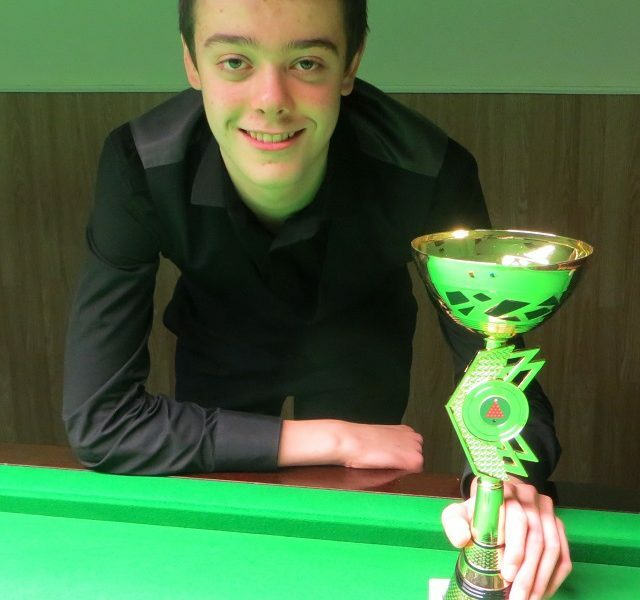 Meanwhile, 12-year-old Sykes said it felt “amazing” to have gained a coveted spot on the EASB Premier Junior Tour. There is no player younger than Sykes currently on the Premier Tour, which is run by the English Association of Snooker & Billiards (EASB), the game’s national governing body. Sykes had to reach the semi-finals in Gloucester to make it mathematically certain of winning the third qualification spot. He kicked off a glorious day by defeating his Chandlers Ford clubmate Connor Benzey 2-1. “I really wanted to win that first game,” said Sykes. He then beat Riley Ellis (Clyffe Pypard, North Wilts) 2-0, Cowdroy 2-0 and Aidan Murphy (Bristol) 2-1 from 1-0 down to top his round-robin group. A 2-0 victory over Riccardo Drayton, another clubmate, in the quarter-finals guaranteed Sykes the promotion spot. Meanwhile, Steven Hughes, also based at Chandlers Ford Snooker Club, lost 2-1 from 1-0 up to Jamie Wilson (Havant) in the quarter-finals which meant Murphy could take the second play-off spot if he won the final. But the 13-year-old from Bristol was knocked out 2-1 by rankings winner Alex Clenshaw (Harlow) in the last-four. Hughes and Wilson, who beat Sykes 2-0 in the last-four and then lost in the final, will compete against two players from the Midlands region and four from the North in Walsall in June for two more promotion spots.